When it comes to Summer Staples, there's a definite running theme for me. I love a fresh and fruity scent, and for me these everyday essentials are the perfect accompaniment to a sunny Summer's day! These three fruity favourites are my current shower routine, and the tropical fragrances compliment each other beautifully! Starting with Shampoo, I opt for something light and cleansing, with a fruity exotic fragrance. I love the OGX range for their sheer choice and great quality, and this Coconut Water Shampoo is refreshing and light. Perfect for clarifying and getting rid of the salt and sand residue after a long day at the beach! To condition my hair, I go for another offer from the OGX range, this time the Lemon Highlights Conditioner. Applying this to the ends of my hair leaves them feeling soft and moisturised and enhances the blonde tips to leave my hair bright with a subtle vibrance. I love anything with a coconut fragrance and this Philosophy Shower Creme, with its creamy exotic scent and lavish texture, is a tropical treat! Not the most glamourous of topics, but the light and calming Cucumber and Green Tea scent of this Dove deodorant makes it the perfect option to keep cool in the heat. This Body Sorbet from The Body Shop has a delicious Satsuma fragrance and a beautifully light texture that refreshes and cools the skin. With extracts of Argentinian Satsuma oil, it keeps the skin moisturised without leaving any unwanted stickiness. Perfect for a hot, Summer's day. 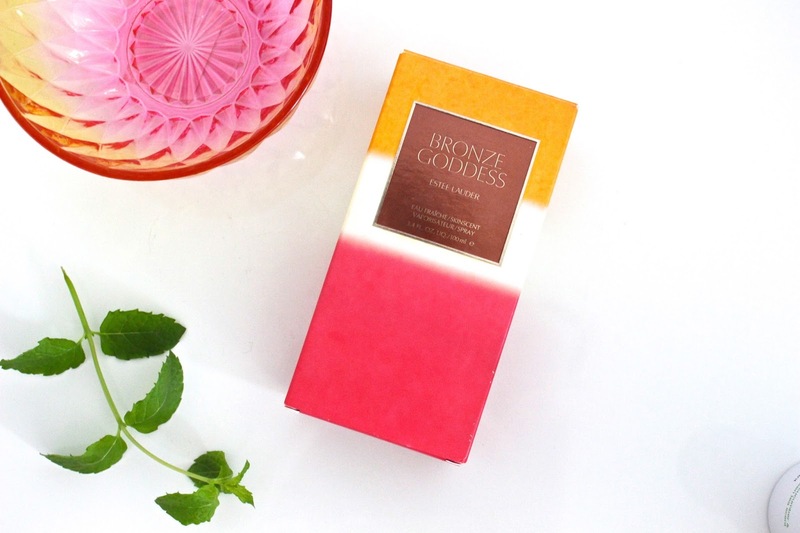 And finally, a Summer Staples post would not be complete without a special mention to my all time favourite Summer fragrance - Estee Lauder - Bronze Goddess. Released every Summer as a limited Edition addition to their usual range, this ever popular fragrance is the perfect blend of coconuts and sunscreen and for me just sums up the smell of Summer. Excuse the battered old bottle, this one has been well-loved! I'm hoping to get my hands on this year's new release - a stunning sunset ombre glass bottle - before the Summer is over for good! Thanks for taking the time to peruse my Summer Staples! Perfect picks for summer. I love coconut and lemon, they smell amazing!